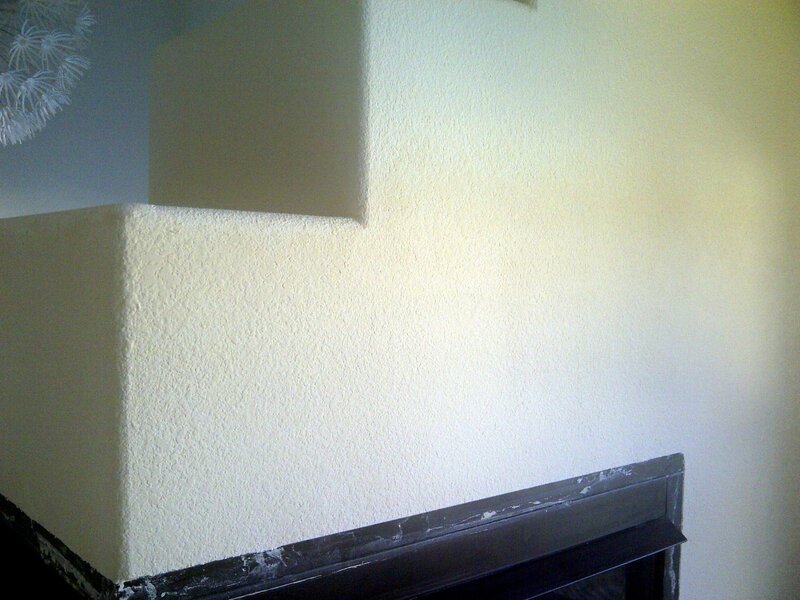 If you can recall what the fireplace looks like, I think there is much improvement from its "before" state. 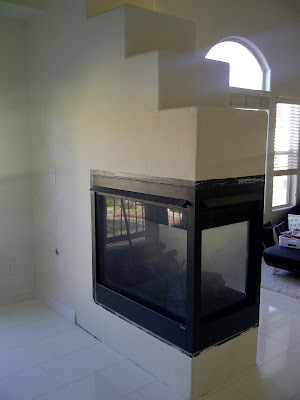 By clicking on the 'remodeling living room' tag at the bottom of this post, you'll see my previous post about the fireplace. 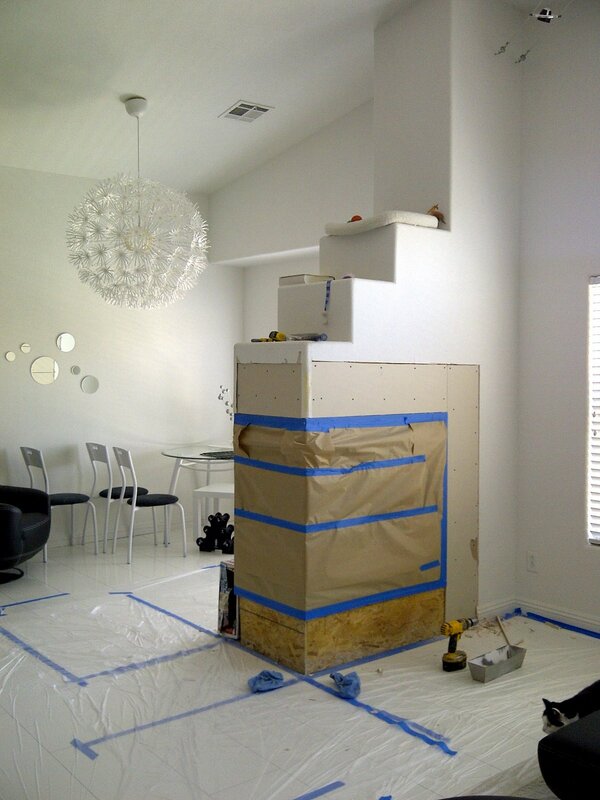 The dry wall guys did a fantastic job and in only one day! The work involved cutting out the dry wall around the fireplace because the originally dry wall was damaged from the destruction of the tiles which had surrounded it. 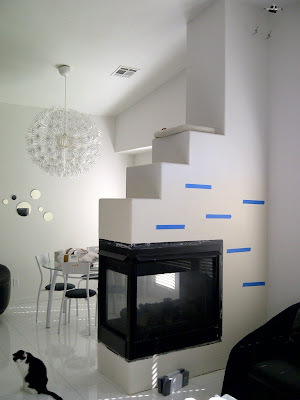 We originally planned to put up tiles but opted to finish the dry wall for clean, simple look. I had no idea there was so much work involved and the guys took care in making a canopy surrounding the work area when the time came for them to texture the dry wall. Viola! Their part was done. Now all we had to do was paint, install the baseboards, and hang the shelves. No detectible seem to the naked eye. I was quite impressed with the workmanship and worth every penny! I wanted to break up the plain wall somehow but didn't want to put tiles or something that would be too busy so in this photo, I plotted where the floating shelves would go. The idea came to me because I had wanted to give Elgy (pictured in the bottom left of the photo) a way to get up to the bed perched atop of the fireplace. Unlike her sister, Havi (the calico cat) who can launch five feet from the dining table or from the arm of the couch, Elgy is not able to get to jump that distance (she has short legs). So the idea of the shelves was to provide "steps" for Elgy. 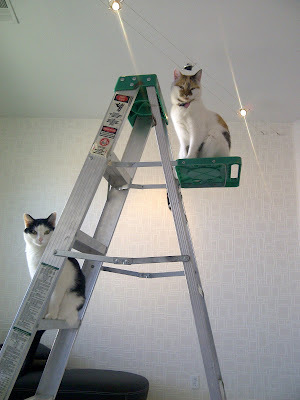 Of course, both of them needed to have a supervisory role through each step in the process! As simple as this project sounds, it took us over the course of several weeks to complete it with both of us working day and night at our jobs and John's business. 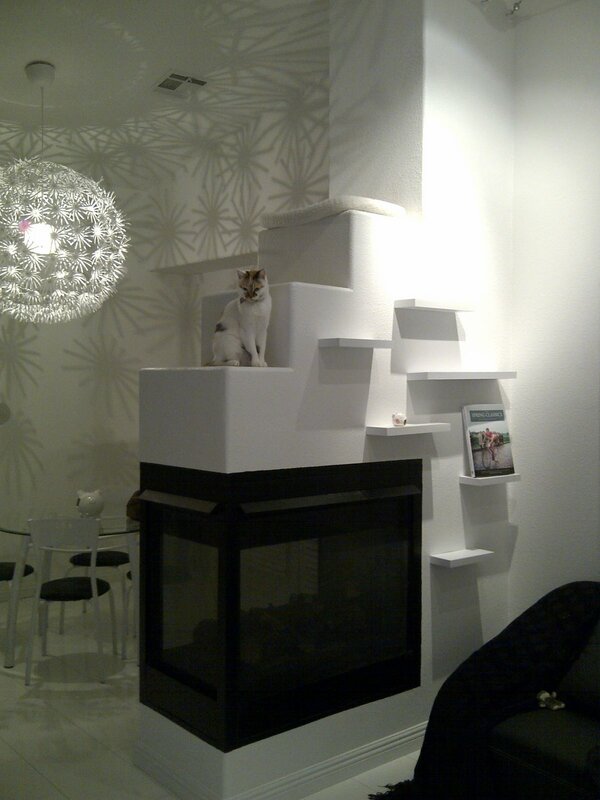 Finally the fireplace was finished and Havi was the first to give her approval! 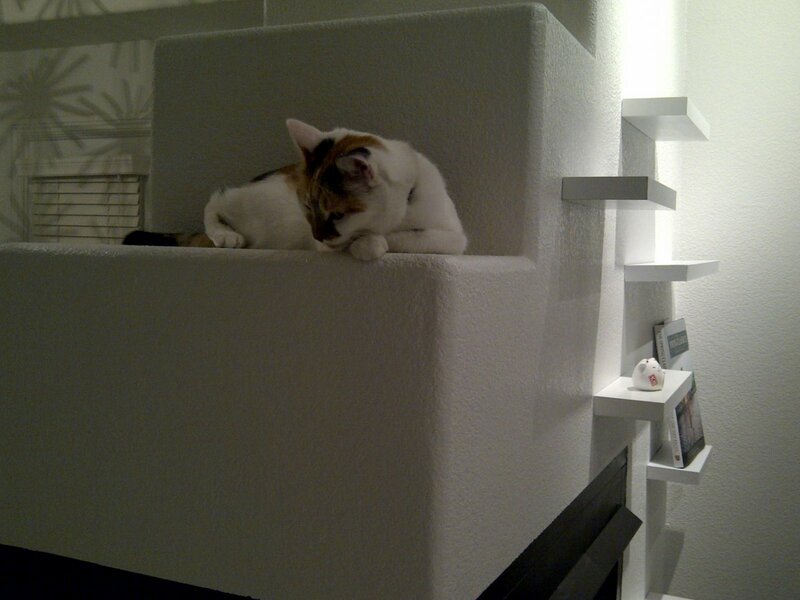 She sure missed her bed and was up there the first night after the shelves were hung. Havi doesn't use the shelves as steps to climb above the fireplace and prefers to her usual route. 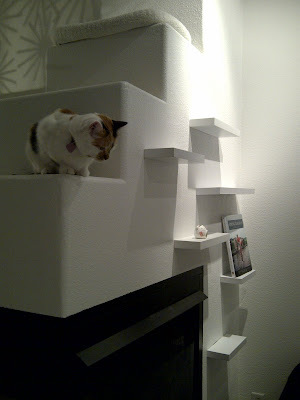 Here she is carefully inspecting our work (it is hard to tell in these images but the shelves are of three different widths). And when she was satisfied, she settled down and observed Elgy from above. Why are you putting pictures and things on the cat steps? I would kill to have that kind of space at home! Unfortunately I can't DIY my way to domestic bliss. I even have to rely on professionals to do my chimney repairs. @Joe - the girls didn't use it after all the work we went through to build them steps so I made use of it instead. @Al - I miss our fireplace. The home we live in doesn't have it. 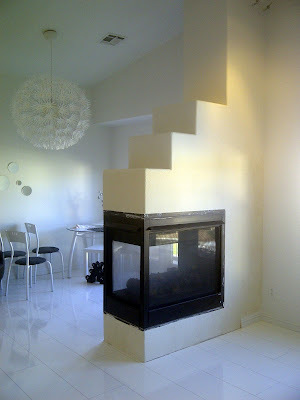 You would think all homes in Reno have fireplaces. That fireplace looks marvelous, I'll be sure to copy it. Thanks.